And I’m damn proud of it. Of course, this doesn’t mean I’ve lost weight (I still have those 8 pre-baby pounds to lose) or that I eat all that great all the time (I don’t) … The important thing to share is I began using it after I was already pregnant with Ben and, in spite of being a busy gal, I never missed a day — not even the day I had him! 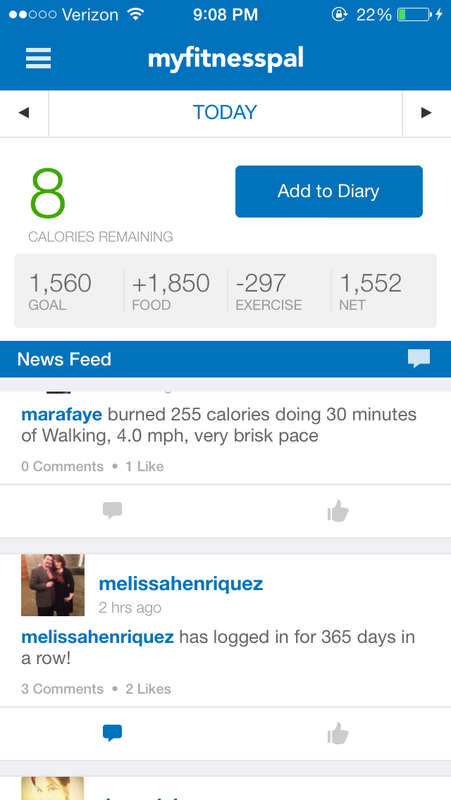 I go over my goal constantly and am far from a model MFP user … but I love the app. For someone like me who loves accountability and following a program, MFP — which is free — is an awesome tool. I don’t follow it to the T (for example, it doesn’t take into account nursing calories — which Weight Watchers does — so I’ve made my mental goal about 300 calories a day more than MFP recommends) but I love using it as a guideline and to see how I’m doing nutrition-wise … which can be alarming when I see my daily sugar intake. Oops. And I love that a lot of my friends use it, too, as there’s strength and motivation in numbers. I’ll get there … And in the meantime, I’m going to celebrate these 365 straight days of journaling! How about you? Do you use My Fitness Pal or another food/fitness tracking app? Wow! That’s impressive – and I thought my 40 days was pretty good. 🙂 I like MFP a lot, but I do have to keep myself in check on occasion. Have you thought about changing the daily calorie goal (I don’t know if you can do it from the app, but you can on the site) or adding nursing as an exercise so that you don’t have to mentally calculate the extra calories? Oh that’s a great idea!! I haven’t done that. I should try!! That is awesome!! I about cried when I missed one day over Christmas and lost my streak. I was only like 70 days in though, not even close to a 365 day streak!! You rock! Thanks, Katy! Awww … you’re doing awesome and look phenomenal, mama! i use sparkpeople and have for several years now. now i use it more to look at my intake on a macro level (protein/carbs/fat) so i can monitor that way. i still watch calories because i’m a nut job, but less so. 😉 i haven’t used mfp. curious about the differences (pros/cons). kudos to you for sticking with it and for allowing yourself grace along the way!